The Beautiful Dark series has been one of my favorite angel-centered young adult series and I’m sad to see it end. There was character growth, a great plot, two swoon worthy guys, and a main character who isn’t perfect but doesn’t let that get in her way. A Radiant Sky was a wonderful ending to this series, and even though it had a couple moments that were a little cheesy, I loved it. Skye has grown up a lot in the past year. Since discovering she is the daughter of angels, one from the Order and the other from the Rebellion, she’s had attempts on her life, on her friends’ lives, and watched as people she cares about suffer. Instead of taking the easy way out by picking a side to fight for, she defies everyone and chooses to fight for herself, for her cause. She will not belong to either faction and allow herself to be controlled as a means to an end. Making this choice puts both sides against her and puts the lives of those around her at risk. Skye has really come into her own power. She’s embracing her powers, learning how to fight and control them. She’s playing an active role now, making her decisions and not allowing them to be made for her. She’s standing up to her fears and learning how to fight past them, even if she can’t get rid of them. Her family and friends are what make her strong and she uses those bonds to motivate her. It was wonderful to read her becoming the woman she needed to be in order to fight for the world she loves. Asher is a little absent in this novel, but I don’t really mind. It forced Skye to realize who was important and worth fighting for. The moment they come back together is completely worth every moment of Asher being gone. Devin also plays an interesting role in this novel. The love triangle is gone, but that doesn’t mean he isn’t in Skye’s life anymore. They come to an agreement about their relationship, one that they both can live with, and in the end it makes them both stronger. There were only a couple moments that took me out of the novel. I’m all for personal reflection and realization, but there were times when it went past reflection and moved into nearly eye-roll inducing. It didn’t happen enough to really hurt the book for me, but I could have done without them. There were also a few things that fell into place a little too perfectly; a little more challenge surrounding those moments would have been nice. 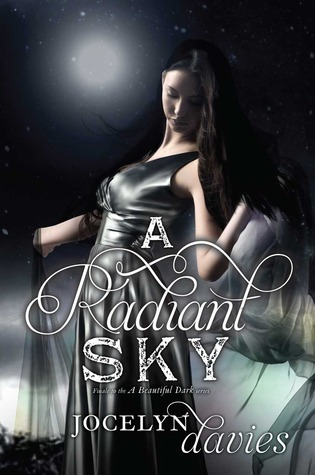 A Radiant Sky is a fantastic conclusion to a great series. It is the showdown between order and chaos, where the outcome isn’t known until the very end. It kept me guessing and intrigued, wondering how things would unfold and what the losses would be. And when I finally reached those last words, everything felt right. It was the ending Skye earned. This entry was posted in Something a Little Different, Young (and New) Adult and tagged Fantasy, Jocelyn Davies, Paranormal, Supernatural, Young Adult.